There are pictures (here and here). Thank goddess or I might not remember that it happened at all. Aside from the tan-line evidence, of course. I forget how great it is in St. Maarten. We go every year to my timeshare there. I'm a bit of an adventurer, so I like to explore different places. I think, why go there again? I've been there. But that's the beauty of it, really. We've explored the towns, the beaches, the hikes, the water sports, the restaurants. Our beach is one of the best for swimming. And we can slip upstairs to our room for drinks, snacks, meals. Or perch at the beachside restaurant if there's an afternoon shower. We can chat to the other couples we know who share our week every year. 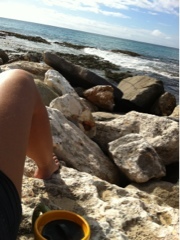 This is what my day looks like, in the Caribbean. Every morning, I head to the rocks with my coffee and listen to the waves, watching them wash over the coral, trying to imprint it on my brain so that I may later invoke that metaphor for my life. After bidding a good morning to the various crabs who live on those rocks, I saunter back to the room for breakfast. Then out to the beach to read. And I read and read, not feeling bad at all that I'm not out exploring something else right then. I'm happy exactly where I am. When I get hot, I place my bookmark, drop the book and the walk into the turquoise water to cool off. Lather, rinse, repeat, until I watch the sun set from my chaise.